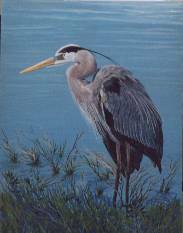 Robert Mier's paintings are an expression of his love for Florida and her vast variety of wildlife, peaceful lakes and rivers which he displays in his panaromas so beautifully. He endeavors to capture with paint and brush the beauty and serenity of a Florida that is slowly diappearing. "Snowy Egret with Spanish Moss"